I hope you’ve had a great weekend. I love the weekend. It gives me chance to be a bit more creative than I can in the week, and gives me the time to *think* about what would make an interesting post. When I did my Giveaway, a few people said they’d like to see my stash. I am going to aim to make this a weekly series – and yes, the Purplishes will be Post 250! Here is the first part of my stash – the Greens. I really have a love hate relationship with the greens. In life, green is one of my 4 fave colours (red, purple, green, black). I have green eyes, which I am very proud of, and I love writing in green and would even decorate a room in green. However, on the nail? Neh. It just doesn’t do it for me. So, for a girl who doesn’t like green, I think I have one hell of a green stash lol. However, it’s a sign of how meh I am about them that they don’t even have their own home, they have to shack in with The Blues. First of all, Massini Neon Greenlight (bought in a bundle of 20 off ebay, and only kept for art), the lovely OPI Stranger Tides, CG Starboard, bought for art, GGLizard Belly, no words required and Barry M Lime Green – an amazing colour, kept for art. Some glitters – Kleancolor Peaceful Heart, CG It’s Alive, just sensational, Sinful Colors Call You Later, Pop Rocks Backstage Pass (I bought 20 of these for about £5 off ebay. I will probably mostly use this one for frankening). A mini Color Club Under The Mistletoe (from a boxed set, kept for art), the infamous Zombie Snot franken, Essence twins Bella& Edward. Then we move to the untrieds, not all of whom will be keepers. I try to keep the untrieds separate, as I have a tendency to forget about them otherwise! The magnetic Ego Green, Del Sol Spring Fling (mood changer, goes purple in bright light), CG Laser Lime (v excited to try this, also partly bought for galazy art work), Toma Mood changer (part of a 6 pack, changes from Avocado glitter to silver glitter – sounds amazing). 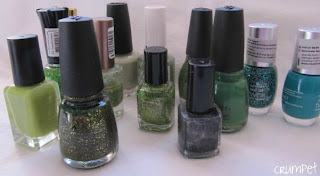 More untrieds – Palladium Nail Polish (bought from one of my fave ebayers, it was cheap and nice), the green Color Club from the Foiled collex, lol another mood changer (seriously, this was in a bundle and hasn’t been discarded yet – it goes green to yellow, cannot imagine I will like it, so may become a frankening experiment), Wet n Wild Give Me A Price Quote (what a strange name) from the Ice collex, and Jolly Holly, a green glitter franken from Carrie. And finally …. 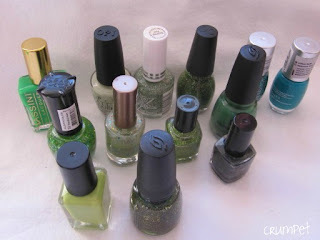 4 Barry Ms, Mint Green, Spring Green, Emerald Green and Racing Green – most of these will probably become swaps. Lol – that’s a LOTTA green ha ha. What’s your favourite green ? 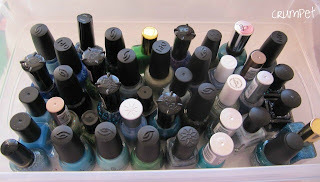 PS I forgot Zoya Dree- oops. She’s a love and takes the total stash to 27. Eeeeek.